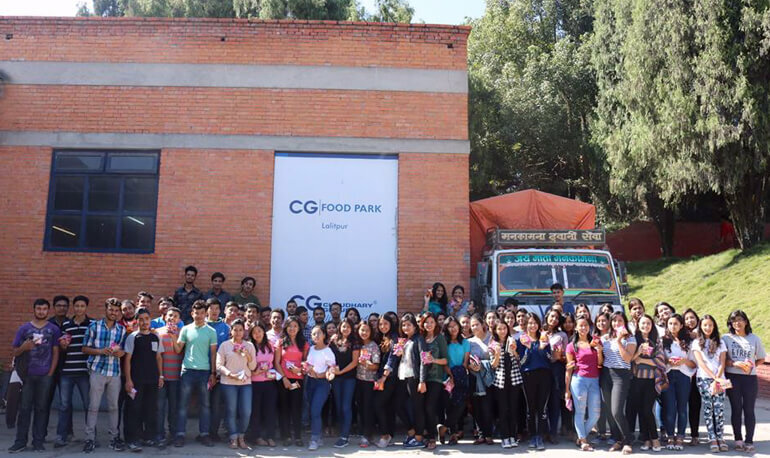 The batch 2014-16, including both marketing and finance group visited the CG Food Park which is located at Bhaisepati, Lalitpur on October 22, 2016. The factory tour was regarding the “Production and Operations Management” curriculum where they were initially given a brief description about the plant and some rules which were to be followed during the visit inside the compound. The briefing session was followed by the visit of the plant. The plant was producing two of the food products of CG. One of them was Noodles and another was the cheese balls. Firstly, the students visited the noodles section where they saw the production of the noodles and the machineries that were being used in the production and after that the students were taken to the other section where the cheese balls were being produced. This was a great opportunity for the students to get a proper insight about the production layout as well as the workforce management at a large manufacturing plant.